Canada’s largest tech startup incubator wants to add more firepower to its leadership team. Two days ago, Toronto’s MaRS Discovery District startedposting ads tohire a president and chief operating officer (COO). 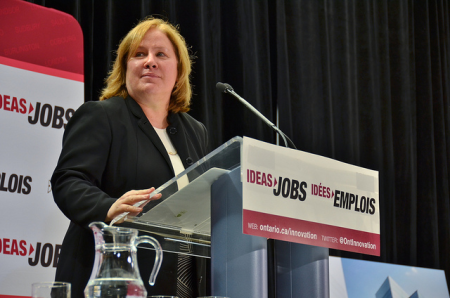 Although CEO IlseTreurnicht, who joined MaRS in 2005, is staying on in the top job, thecombined role of president and COO is a brand new dual position beingcreated at the facility, MaRS spokesman Chris Stevenson confirmed toITBusiness.ca in an email on Wednesday. MaRS is still in the midst of an ambitious, ongoing expansion. LastOctober, it opened MaRS Commons, a new space for Web and mobilestartups. This April it created a new accelerator program called JOLT.And construction to expand the MaRS campus to a total of over 1.5million square feet is expected to be finished in September 2013. The new president and COO of MaRSwill report directly to CEO Ilse Treurnicht (above). The official job posting on the MaRS careers page (sandwichedinconspicuously between postings seeking a “Research Associate” and a“Community Support Rockstar”) offers few details about what the newposition will entail or what type of skills and experience are requiredfor it. The career posting makes no mention of a salary range for thejob. But MaRS officials may be extra mindful of compensation issues infilling the new position after last year’s list of top civil servantsalaies showed Treurnicht’s annual pay jumped by almost $100,000 (or 22per cent) in 2010, a figure that garnered headlines in the Toronto Sun.Stevenson pointed out to the Sun, however, thatMaRS had previously frozen salaries in 2008 due to the economicdownturn. MaRS is accepting applications for the president and COO position untilAugust 3.